It was our one year anniversary. We spent the day together, enjoying donuts for breakfast, a hilarious golf outing, picnic at the park, and a nice dinner out. Nick and I love all the food Atlanta has to offer, and we often try new restaurants. For our one year we wanted to go somewhere more swanky than our average outing, with delicious, interesting food. After reading a handful of rave reviews, we decided on Top FLR. Top FLR is a trendy place in an equally trendy neighborhood, Old Fourth Ward. It’s a tall, skinny building, with a white facade and simple, thin black letters spelling out the name. The exterior gives no hint at what is hidden behind the front door, I felt like I was walking into a secret place, hidden in plain view on a street corner. The interior matched the exterior. The furniture was plain, yet modern. Most of the decor was black and white, with only a pop of color on each table; a turquoise vase which cradled a single, white chrysanthemum. I already enjoyed the ambiance of the restaurant the minute we walked through the door. The lights were low, the music right up my alley, and the menu had a sophisticated simplicity to it, which perfectly fit with every other aspect of the restaurant. I don’t remember what we ate or drank that night. I vaguely remember something with scallops, although that is typical of my fine dining outings. I don’t remember the details of our lives we discussed, I’m sure at some point we reminisced on the perfect day one year ago when we said “I do.” Despite losing details of the night over the last three years, I do remember the moment a familiar song came on. Suddenly our conversation was interrupted as my ears perked up and I tried to place the first few notes of the new song filling the room. A nostalgic feeling tugged at my heart and brain as my ears absorbed the sound. It hit me before the first word was sung. It was our first dance song. Here we were celebrating our first year, wrapping up the night when our song came on. “First Day of My Life”, by Bright Eyes. It is a song I know well, but you won’t hear it on repeat on the radio, it has more of a niche, although still popular following. I was shocked to hear it was being played in that moment, I believe it was meant just for us. It was the perfect end to a perfect day and a perfect year. This moment was meant to be, and we both paused and allowed it to sink in and find it’s way into our memories. Check out my last visual journal post here, which covers the details of our first anniversary day. For this visual journal page I really wanted to capture that moment. I decided to keep a very monochrome color palate, with the exception of the turquoise vase. I wanted it to have the same feel as the restaurant. Once I decided on the colors, I started on the page. I used pencil to sketch out the table and chairs. I had a good visual memory of what everything looked like, but also looked up Top FLR online and scoped out their pictures before I got started. After the table, chairs, and vase were added I took India ink and painted the background completely black. I carefully painted around the table and chairs. India ink is a great medium to get dark blacks. However, it bleeds through everything. To avoid ruining my other pages I ripped out two pages, create my visual journal page outside of my book, then glued the pages back in. After the background dried I used white gesso to paint in the table, chairs and flower. After the gesso dried I used a pencil to add shading to the bottom of the table and to the flower. I used black sharpie to outline the chairs and a turquoise colored pencil to fill in the vase. Once the foreground was complete I added the finishing touches to the background, the lyrics from our first dance song. I wanted the words to completely fill the background, so I sketched them out with pencil until I got the font size just right. I then traced over the pencil with a silver sharpie, which pops really well on dark backgrounds. 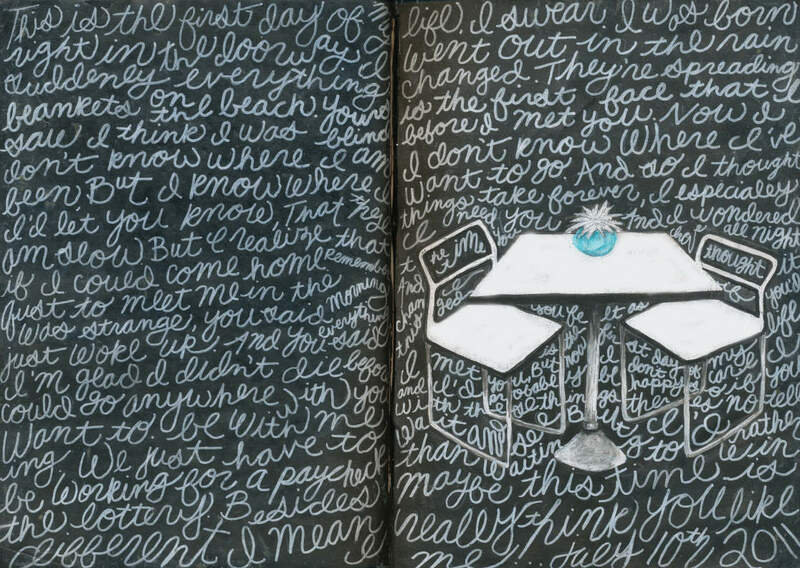 Create a visual journal page about a meaningful song. Some how incorporate the lyrics into the design of the page. Thanks for taking the time to check out my blog and read my post. Help me spread the word about my blog by sharing with others, subscribing, and commenting. I couldn’t do it without your help! Thanks for stopping by!